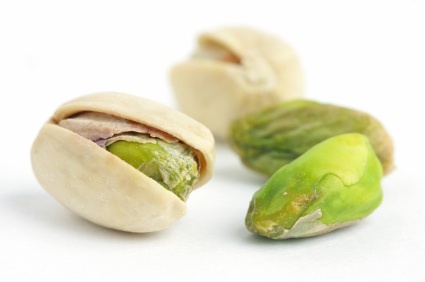 Why use them: They’re nutritious, very tasty, and most importantly – fun! So I started putting MY hands on my hips when I see something festive and saying, “Isn’t that FUN? 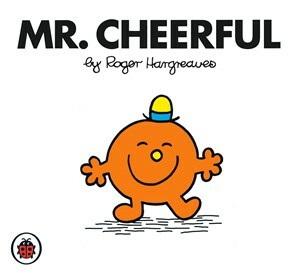 !” in order to make fun of these shiny, happy types. But then, slowly, over the due course of time, I actually BECAME one of these people that do this thing. Then my roommate Scotty started doing it, probably to make fun of me. Then my friend Brant started doing it. Then Eric. You see where this is going. And now it has become this extremely irritating phenomenon that we have now just annoy each other with. It’s actually kind of tragic, really. Having an idea for a recipe, or just a combination of foods and flavors, can be a labor of love. Most of the time it will take several tries to get a recipe just right. So I’m always kind of thrilled when it comes out right the first time. 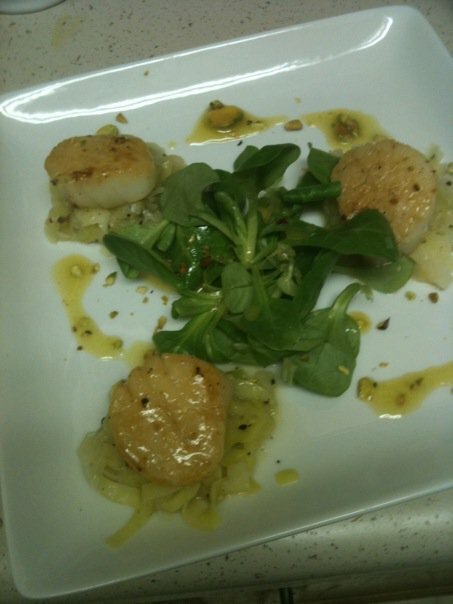 This dish – Seared Scallops with Melted Leeks and Pistachio Vinaigrette – is just such an anomaly. It came out just right and it was simple and delicious – the first time. Now that’s what I call fun. 1. Melt the butter in a small skillet over medium heat. Heap in the leeks. They should be crowded. The leeks will cook down as they melt; this will take about 6 – 8 minutes. You want to catch them when they just begin to get mushy, but when they still have a nice texture. 2. While leeks are cooking, prepare the scallops, and make the vinaigrette. Remove muscle from the scallops if present, and season with salt and pepper. For the vinaigrette, chop the pistachios coarsely (I like to leave a few whole). 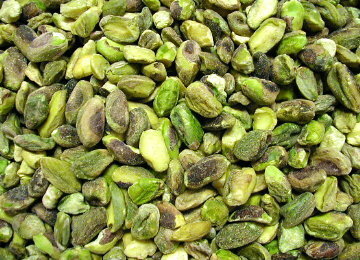 Reserve just a bit of the chopped pistachios for garnish and add the rest to a bowl. Add the honey, mustard, the juice of 1/2 of the lemon (reserve the other half for later), salt and pepper, and whisk together. Drizzle in 2 Tablespoons olive oil. Taste and adjust seasonings. 3. When leeks are done, remove them from the pan and set aside. Wipe out the pan and heat the remaining olive oil over medium heat. Sear the scallops until they are cooked through and just barely firm, about 3 – 4 minutes per side. They should have some nice color. Just before they are done, squeeze the reserved lemon half over them and swirl the pan around to cover the scallops with the lemon and pan juices. 4. For a delightful presentation, I like to spoon the leeks into small mounds and put the scallops on top, then add the greens in the middle of the plate. Drizzle the vinaigrette over the whole dish and sprinkle the reserved pistachios over to garnish. To be sure, the idea for a pistachio vinaigrette is not mine originally. I’m not sure where I heard of it first, but it sure is tasty. This vinaigrette recipe also works well with hazelnuts. A vinaigrette with a little crunch and a citrus tang is a nice foil for many types of seafood, and you just need a little drizzle to add flavor, and (yes, I’m going to say it again) fun – to your dish and to your table. Anyway, this is a fun dish to impress your guests with, and it requires minimal skill and prep time. In fact, the leeks and the vinaigrette can be done in advance – just don’t add the nuts to the dressing until just before serving, since they will get soggy. Just reheat the leeks gently before serving. A nice dish for entertaining.